I was just going through projects I’ve taken pictures of but haven’t blogged yet. 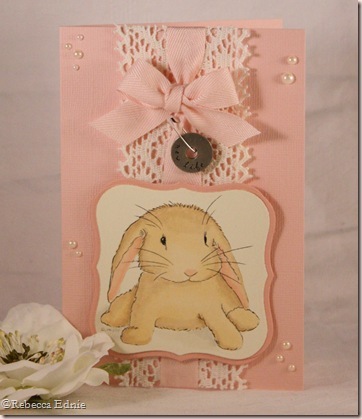 This is one of my favourite cards ever and I can’t believe I haven’t blogged it sooner! I got the image FREE by playing the challenge Laurie of Clearly Delightful posts every month on the 5th. (Be sure to play! EVERYONE gets a free image! )When I found out I was going to be on her design team, I made this card only to find out she had sold the rights to this image to Clear Dollar Stamps so I couldn’t use it for her DT. I liked it so much, I made another like it in blues and greens with a baby goat image, so if it seems familiar, that is why. I think this bunny has to be one of the cutest images I have, whether digi or rubber/clear. The chubby body, the splayed out back feet, it just reads ‘baby’! The bunny was coloured with Copics, I have no idea of the colours anymore, if I had to guess, I would say light E50’s and maybe a touch of E31 or 33 and R11 for the ears and W1 or 3 for the shadow. The lace is actually two pieces; the seam is covered by the ribbon which is a lovely soft twill I wish I had way, way more of! I hope you all know how easy it is to use digis! I just import them into Publisher, right click to resize to a specific measurement or just drag one of the corners to resize by eye, put cardstock into the printer and THAT IS IT! I like to print several at a time to save paper and keep them around for use whenever I want something to colour. SO EASY PEASY! I sure hope you will try them! Paper: ivory CS-Taylored Expressions, darker pink CS-Pink Pirouette-SU!, light pink CS-Bazzil? Previous postI Like you Thiiiiiiiiis Munch! Rebecca, this is the sweetest. Love your coloring. Wow. I just love this image. It's so cute! I recently sold my card to a gal for a baby shower with this image on it. I bet yours is gonna be a hit too! 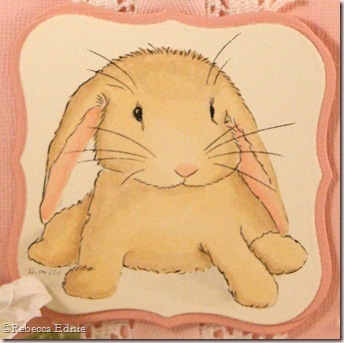 Adorable image and beautiful card!